The Tender Bar Gets Cinematic? So far I’m really enjoying J.R. Moehringer’s The Tender Bar. It’s getting me through the madness of packing up my life to move. Of course, whenever there is a book I like (or don’t like actually) there’s usually a movie to go along with it. What can I say, Hollywood isn’t so creative. 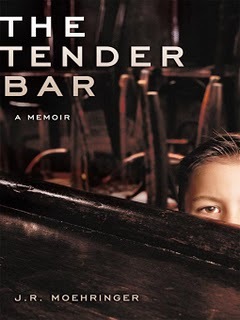 The Tender Bar, though, isn’t a movie… yet. However, Scott Rudin bought the film rights back in 2005. You might know Scott Rudin as the producer of such films as Julie & Julia, Revolutionary Road, There Will Be Blood and No Country for Old Men, just to name a few of his most recent work. Wikipedia also tells me he is working on an adaptation of The Amazing Adventures of Kavalier & Clay, another book I have to read, so he’s very involved in Robin’s Reading List. Still, no movie exists yet. IMDB doesn’t even have The Tender Bar listed as a movie in development, making me doubtful it’s happening anytime soon if at all. So, while I would love to share a trailer with you, I can’t. Instead, I’ll leave you with a book trailer for The Tender Bar… a very unofficial book trailer. Oh, the things you find on YouTube. Enjoy! This entry was posted in About the Books and tagged book trailer, jr moehringer, scott rudin, the tender bar, the tender bar movie. Bookmark the permalink.